Welcome back to Tomato Dirt! A couple of times a month, we’ll send you this newsletter packed with tips about growing tomatoes and using them. 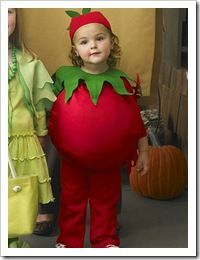 Tomato lovers and gardeners can steal the show on Halloween by dressing as a tomato or other fruits or vegetables. It’s easy and fun to make a tomato costume! Dressing up as a tomato is unusual and creative. Invite siblings or friends to dress up as tomatoes, too, so you can make a “bushel.” To make a tomato costume you will need just a few items: an extra-large red sweatshirt, green or red sweatpants, green felt, material for stuffing, string, and a hot glue gun. Gather your materials and then read the easy-to-follow instructions here. Or you can simply purchase a tomato costume for adults or children. Get more tomato costume ideas on our Tomato Costumes Pinterest Board. Tomato Dirt is on Pinterest! Join us on Pinterest! Browse our 100+ boards (and growing) for all kinds of tomato inspiration and practical information: growing tomatoes, tomato seeds, cold frames for tomatoes, tomato books, tomato greenhouses, , indoor tomatoes – even crafts to do with a tomato theme. Happy pinning! 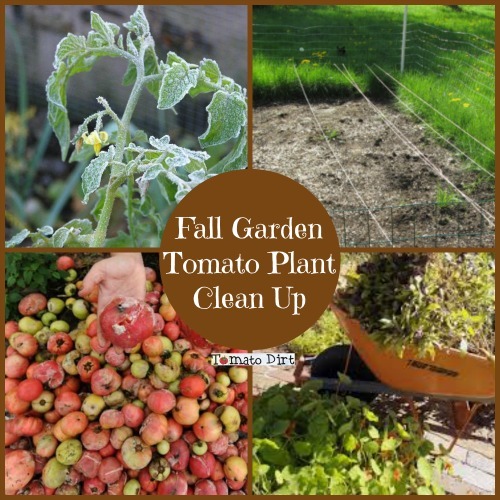 If it’s fall, then it’s time to clean up the tomato patch. 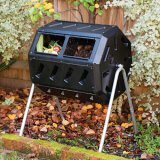 It takes only a few minutes, but just that little bit of time means a healthier garden next year … not to mention a winter garden that looks better! It’s OK to grieve a bit. But then make sure you take these steps. Pick up fallen fruit. Dropped, “mummified,” or rotten tomatoes on the ground can breed tomato diseases. Prevent that by collecting them and destroying them. Remove tomato plants. 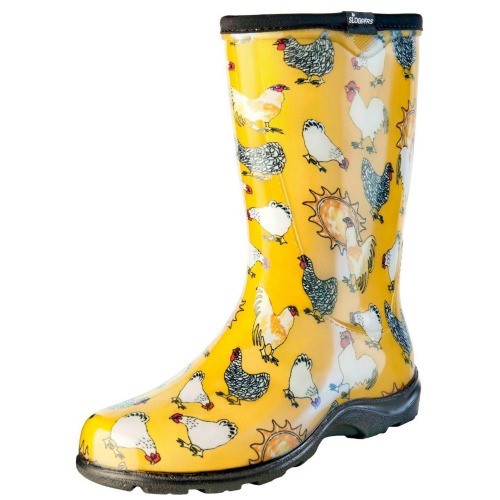 Don’t leave them in the garden! Pull up spent tomato plants, including roots, that are finished producing or have been killed by frost. 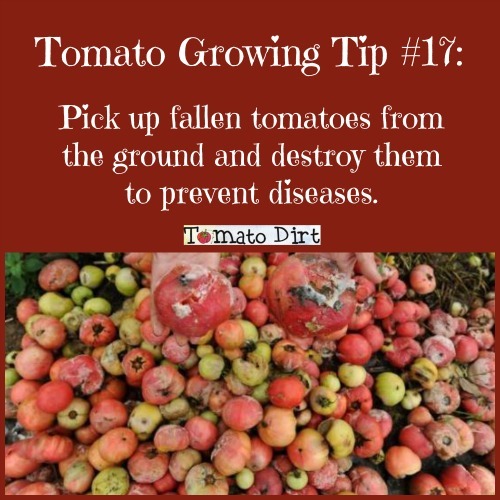 Destroy the diseased tomato plants. Did they have wilt or blight? Those organisms will stay in the plant, the compost, the soil. It’s time to say goodbye to those tomato diseases. Burn or discard diseased plants. 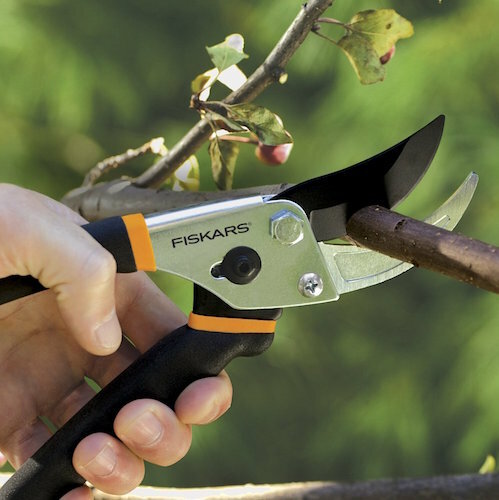 … and get more helpful tips on our Fall Garden Clean Up Pinterest Board. Get more tips for growing tomatoes on our Tomato Growing Tips Pinterest board. That’s it for now. More next time.